Bills! Back to School! Broken down car! Sickness! Preparing lunches...dinner! So many things that require our time. Have you ever thought, "When is it MY time?" I think we all have wanted to or have said, "Calgon, take me away!" The truth is that each one of us has something and/or someone (or many someones) pulling at us demanding attention in one form or another! That's life! And really, there's no way to not have that unless you never marry or have children, never have any responsibility. There will always be someone relying on us. It's in those times when I want to be whisked away to a deserted island that I remember Psalm 61:2 NLT. "2 From the ends of the earth, I cry to you for help when my heart is overwhelmed. 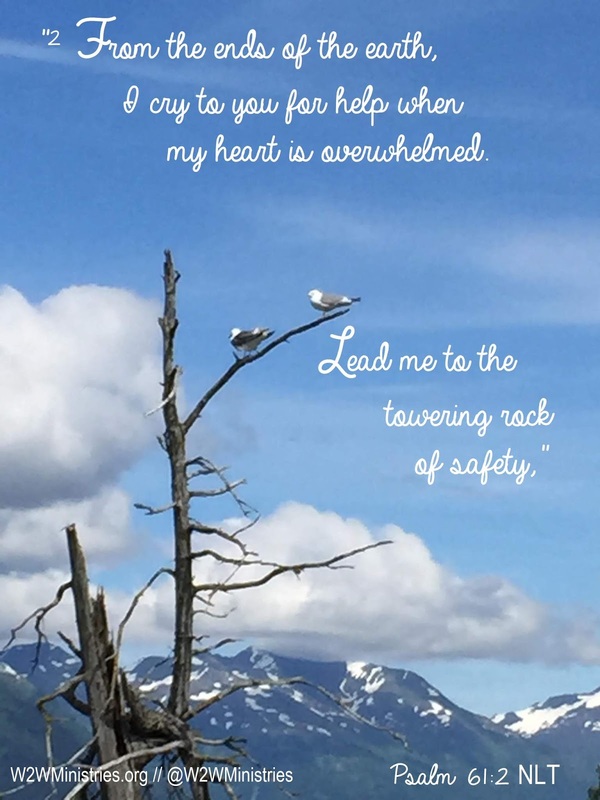 Lead me to the towering rock of safety,"
There is nothing in this world that can take me from the place of refuge my God offers. When I get overwhelmed, I just cry out to my Abba Daddy, God, and He responds by telling me to crawl up in His lap and lay my head on His chest! I thank God I don't have to live this life all by myself. I certainly couldn't do it if not for Him! !